Sir Samuel White Baker was born in London, on June 8, 1821. From early manhood he devoted himself to a life of adventure. After a year in Mauritius he founded a colony in the mountains of Ceylon at Newera Eliya, and later constructed the railway across the Dobrudsha. His discovery of the Albert N'yanza completed the labours of Speke and Grant, and solved the mystery of the Nile. Baker's administration of the Soudan was the first great effort to arrest the slave trade in the Nile Basin, and also the first step towards the establishment of the British Protectorate of Uganda and Somaliland. Baker died on December 30, 1893. He was a voluminous writer, and his books had immense popularity. 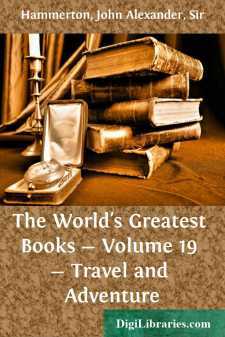 "The Albert N'yanza" may be regarded as the most important of his works of travel by reason of the exploration which it records rather than on account of any exceptional literary merit. Here his story is one of such thrilling interest that even a dull writer could scarce have failed to hold the attention of any reader by its straightforward narration. In March, 1861, I commenced an expedition to discover the sources of the Nile, with the hope of meeting the East African Expedition of Captains Speke and Grant that had been sent by the English Government from the south, via Zanzibar, for that object. From my youth I had been inured to hardships and endurance in wild sports in tropical climates; and when I gazed upon the map of Africa I had the hope that I might, by perseverance, reach the heart of Africa. Had I been alone it would have been no hard lot to die upon the untrodden path before me; but my wife resolved, with woman's constancy, to leave the luxuries of home and share all danger, and to follow me through each rough step in the wild life in which I was about to engage. Thus accompanied, on April 15, 1861, I sailed up the Nile from Cairo to Korosko; and thence, by a forced camel march across the Nubian desert, we reached the river of Abou Hamed, and, still on camels, though within view of the palm-trees that bordered the Nile, we came to Berber. I spent a year in learning Arabic, and while doing so explored the Atbara, which joins the Nile twenty miles south of Berber, and the Blue Nile, which joins the main stream at Khartoum, with all their affluents from the mountains of Abyssinia. The general result of these explorations was that I found that the waters of the Atbara when in flood are dense with soil washed from the fertile lands scoured by its tributaries after the melting of the snows and the rainy season; and these, joining with the Blue Nile in full flood, also charged with a red earthy matter, cause the annual inundation in Lower Egypt, the sediment from which gives to that country its remarkable fertility.